BusinessWeek recently reported that SABMiller is looking at several low-cost alternatives to barley. Cassava is one of the most promising. Cassava is the third largest source of carbohydrates for human food in the world. This woody shrub yields more food energy per acre per day, compared to almost any crop other than sugarcane. SABMiller is also looking at sorghum as a much lower-cost alternative to corn and barley, at least in poor countries. 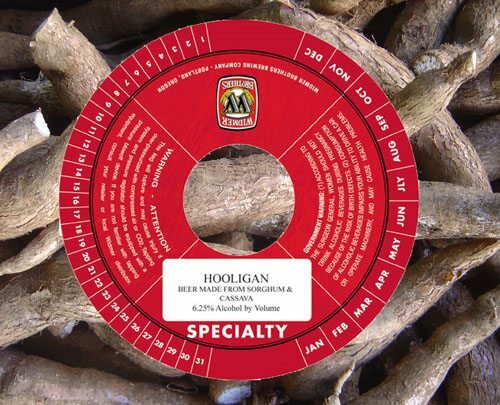 The Hooligan label is way ahead of the trend here, using both cassava and sorghum. It is likely that this Widmer product was too early. Under this 2008 TTB Ruling it is unlikely TTB would re-approve the product, and this may explain why the current status of this label is “surrendered.” TTB requires “beer” to be made with malted barley and hops. Ah, that might explain why Bard’s gluten-free beer has been so difficult to find. (I note that their latest COLAs are marked “surrendered.”) It was a 100% malted-sorghum brew, and reasonably tasty. Cassava is just one of a number of starches used by the US brewing industry during the post WW II years when grains were being shipped to Europe during the Marshall Plan. Kurt Becker from the Siebel Institute of Technology in Chicago wrote a paper on the extension of non-typical starches used in brewing. More on this in one of my books, Beer & Food: Am American History. Sorghum has been used for years by Guinness in Nigeria to supplement their insatiable taste for the stout. If I recall, there’s currently 3 breweries pumping out Guinness in the African country.